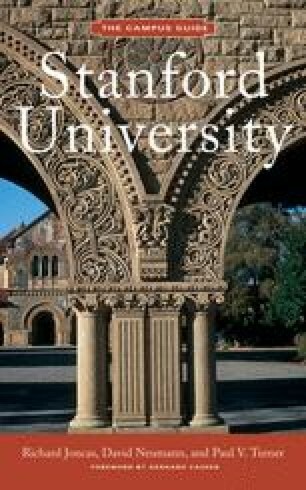 Throughout its history, Stanford University has struggled to mediate its past and present architecture, landscape, and planning. This historical dialogue reveals itself in distinct geographical and chronological zones that define the campus plan. Lauded by Lewis Mumford for its “concentration, compactness, [and] unity,” the heart of the campus, known as the inner and outer quads, has affected all subsequent building on campus and has been both its great strength and its bane. Each architectural generation, whether Richardsonian Romanesque, Beaux-Arts, the international style, brutalism, or postmodernism, has endeavored to marry its idiosyncratic style with the original buildings and landscape. Following Frederick Law Olmsted’s proposals, later quads were sited loosely along the cross axis, although none were fully realized, resulting in a casual dispersal of buildings around a tightly ordered center. Nevertheless, periodic building campaigns organized around the concept of quads developed sharply demarcated areas of the campus, each leaving its own historical imprint. Recent events, including the 1989 Loma Prieta earthquake, moreover, have prompted an era of restoration and renewal, and reinforcement of the planning ideals embodied in Olmsted’s quad plan.